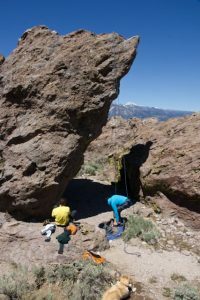 Did you know there’s a miniature bouldering heaven less than an hour from North Lake Tahoe? 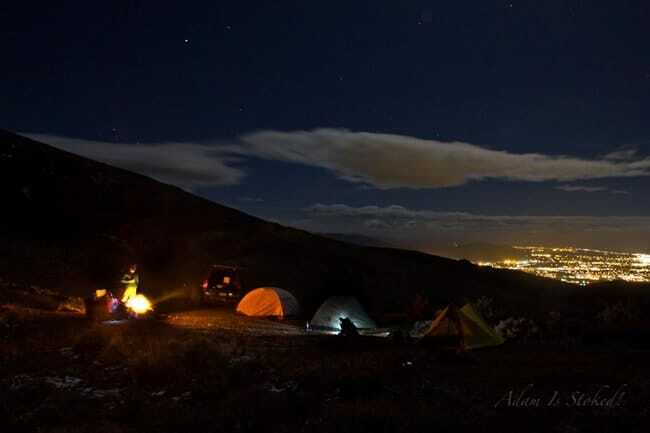 I didn’t either, until myself and a few buddies drove to the high desert east of Washoe Lake last Saturday night. We showed up after dark, found a sweet flat area with a fire ring and a killer view of Carson City, and pitched three different two person backpacking tents. Why not have three tents for four guys? After all, we were car camping and had the option to get as comfortable as we pleased. Once we had a good fire going (it randomly snowed as we left Tahoe and temps had already dropped into the 30’s), Kevin fired up his new JetBoil Flash backpacking stove. He and Jeremy shared dinner while Eric and I enjoyed a couple cold brewskies. We didn’t need to cook dinner; we had each crushed fatty burgers at Five Guys on our way through town and were already feeling a bit lethargic. This would come in handy the next morning however, when we would need as much energy as possible to climb rock after rock and sustain our strength through mid-day. When we woke up the next day I was blown away with all the climbing options just steps from our tents. Sure, it’s all somewhat sharp Tuff and can hurt the hands (Tuff – extrusive igneous rock that forms from the tephra ejected during explosive volcanic eruptions. – geology.com), but I appreciated how many holds there were…everywhere! You could stay on-route, or choose your own adventure. I chose the latter for most climbs that day, making each as difficult or simple as I wanted. Sometimes I would casually explore while preserving my energy for later, and other times I would max out and reach for more difficult holds in an effort to get as much of a workout as possible. I’m kind of back and forth like that. 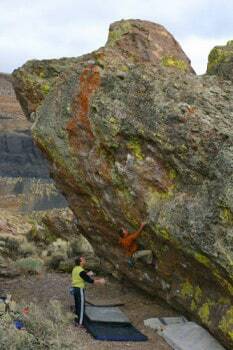 Thus, the beauty of bouldering; freedom to climb up, down, right or left at your own pace. I took a quick walk-thru video of one of the rocks with the most routes on it. There were even some cool tunnels to climb through and plenty of overhangs to practice on. I got about a quarter of the way around before my phone died. After hauling around the crash pads for about four hours, we found a cool overhanging rock with a bolt on top. The rock was 20-25 feet tall and cast a nice shady spot where those who weren’t climbing could relax (and talk smack to whomever was). Since we planned to stop by Ballbuster (top roping area on the east shore of Lake Tahoe) on our drive home, we already had rope, harnesses and protection in the truck. Why not bust it out early and “hang” for a bit? It was the perfect opportunity to stretch out our time here even longer, so we hooked up and spent some time messing around with problems we knew we couldn’t finish. It’s nice to be able to push yourself past your limit and know you won’t fall to the ground. We camped out and woke up to warm, sunny weather. We climbed whatever we wanted, whenever we wanted. We saw three other people the entire day. It was epic. I felt like I was back in the Buttermilks near Bishop, only Washoe offers a lot less rocks – and they’re not granite, the climber’s favorite. *Hopefully I don’t expose anyone’s favorite getaway via this blog post. I don’t mean to give away any secrets…just trying to share the love!